May 13, 2014 - No Comments! Throughout our Acts 29 church network, worship ministries are typically driven by one of two models: the band model and the team model. In the band model, a group of musicians work together consistently. Your “A” band has the same people playing together whenever they are scheduled. In the team model, a single worship leader works with various musicians based on scheduling, and may lead an large number of permutations of drummers, bassists, pianists, etc. Below are simply generalized observations from both our ministry experience, those we’ve coached, and those we have learned from in both models. We’ve used each model for at least 10+ years so we’ve seen how things work in the short run and the longer benefits. It should be noted that we currently have churches using each model. Other factors in your context may affect how applicable this list is for you. If the same leader is leading different teams, there isn’t going to be much difference stylistically, because the leader will bring one genre, background, personal preference, etc. My iTunes library looks very different than the other band leader’s libraries. Every band needs a leader, so the band model offers opportunity for leaders to step up and run their own band. If one guy is leading every weekend there isn’t a consistent place for the up-and-coming leaders to get reps.
We’ve seen greater buy-in and creativity in the band model. Band volunteers are more likely to write songs and work on new arrangements for the congregation. We assign bands to a specific church, and in general, they are expected to do life there. That said, we want each church raising up their own musicians. It is worth noting that when a church starts out, the team model is typically the only practical option until a critical mass of musicians are found and equipped. 5. More volunteers get to participate. The band model means more people will participate in a typical multi-service church. One band can cover the morning gatherings and one band can cover the evening gatherings. A team leader would have to run multiple practices to accomplish this. Additionally, this breadth becomes hugely helpful in a multi-site church. Most worship leaders aren’t wired or designed to lead every Sunday for the long haul. Most can do it for a season, but not sustain passion and quality over a long period of time. Bands help break that up into a good rhythm of leading from stage and “leading” from the floor. 7. Deeper relationships between volunteers. Because folks are playing together more often, they will naturally have deeper relationships (and more conflict that leads to sanctification and depth in their relationships). The band members at our church do life together outside of practice, in part because of the consistency in working together. Because bands are assigned to a church and particular services, you gain the ability to match bands (think style and flavor) with the services who will be best served by that band’s style and abilities. Think about who is in the room at each of your services. Would this band work for the families in the morning services or the college students in the evening? 1. Scheduling the ministry is simpler. Replacing an individual (assuming you have multiple musicians for each position) is easier than swapping out an entire band when schedule conflicts arise. Teams tend to last longer because they don’t unravel when a member moves or steps down from worship ministry. Because they have less of a sense of “my ministry, my band, or my spot” team volunteers don’t push back as much when change is needed because they are used to a rotating cast of co-musicians. Note: This has been problematic with the band model, primarily because people resist breaking off deeper relationships. While this to be expected, it’s important that whatever model you use, the win is defined by what is best for the church, not just the musicians on stage. 3. Quality control/consistency is easier to achieve. The quality (or lack thereof) on Sundays will be more consistent since the same man or woman is leading. In the band model, quality can fluctuate greatly depending on which band leader is leading. 4. Great if you have limited leaders. You can’t have a band or team without a qualified leader. Never try to build a band/team before you have a trusted, tested, godly leader to own, lead, and shepherd that band/team. If your church has one leader that can carry the room on Sundays, use teams to staff different weekends. 5. Easier to recruit individual musicians/vocalists. We’ve found that the “band model” subtly communicates to the musician not yet involved, that you don’t need any more volunteers. This of course is never true. This effect can be minimized by actively recruiting in gatherings. 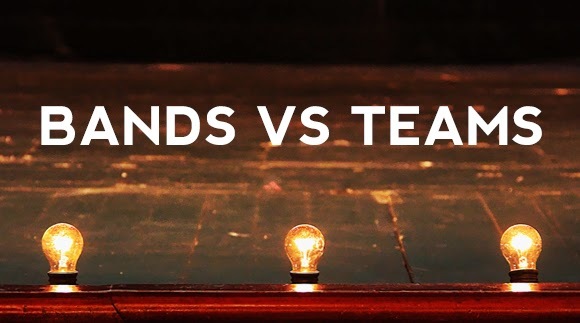 Typically those using the team model will end up with fewer leaders doing the heavy lifting, which means it’s easier for the congregation to feel connected to the worship leader(s). If you rotate a different leader or band each week, you can create an atmosphere of constantly auditioning the worshippers on stage with the congregation adjusting and playing judge. Team leaders will typically invest their time discipling the musicians that rotate through their teams. Band leaders will focus on their band. A worship pastor overseeing multiple bands or teams will need to strategically think through who they invest in. Remember, every leader has a saturation point on how many real disciples they can have. We hope this summary is helpful in deciding whether the band or team model will serve your ministry best. Leave other benefits or disadvantages you have experienced below in the comments.